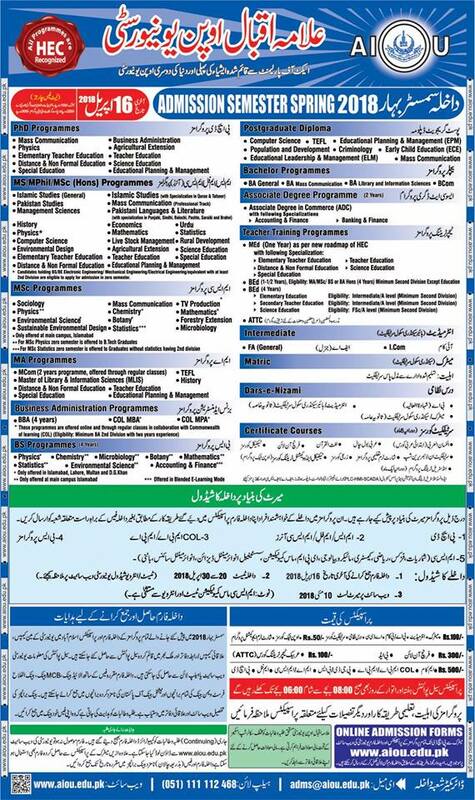 Allama Iqbal Open University has the authority to provide distant learning education to the students from matric to the higher classes of PhD in number of programs and disciplines. 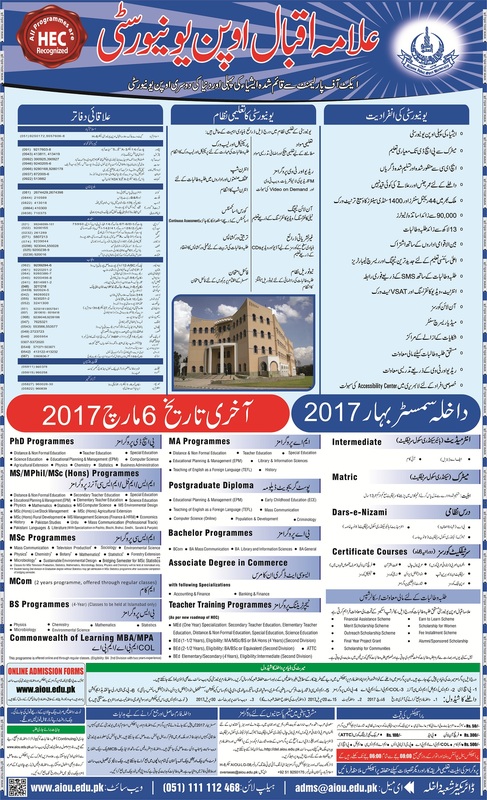 AIOU offers admissions to the students in various subjects and the students can send their admission forms to appear in the relevant exams. 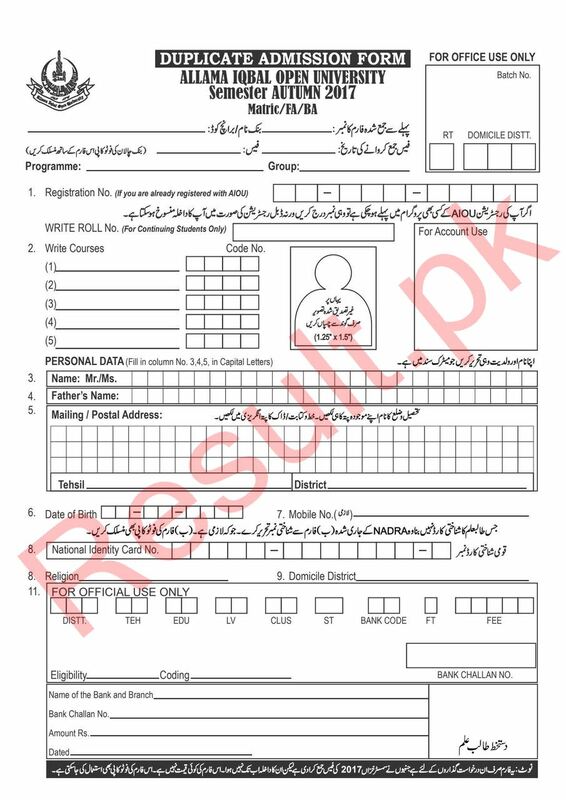 The candidates are asked to visit the site to get the admission forms for different classes and the students can appear in the exams after getting the roll num slips and date sheet. 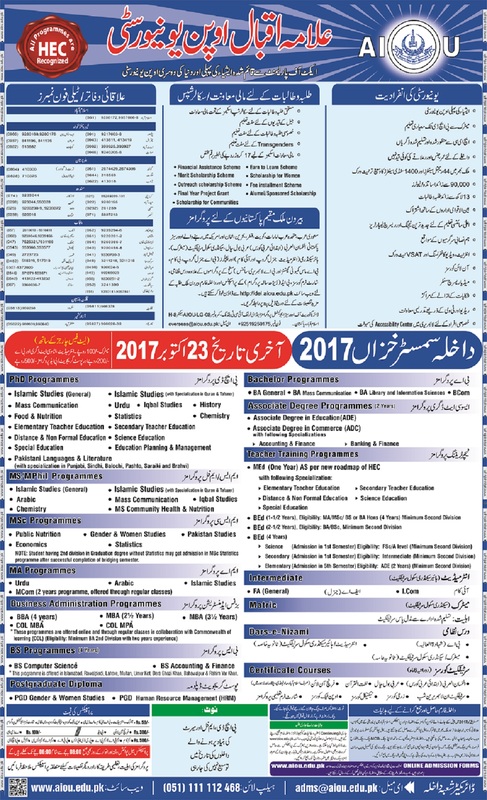 The candidates can visit the site to check the detail of admission in matric, intermediate, graduate, postgraduate, MPhil and PhD classes. The admission procedure, eligibility criteria and other necessary requirements are shared online for the information and facility of the candidates. 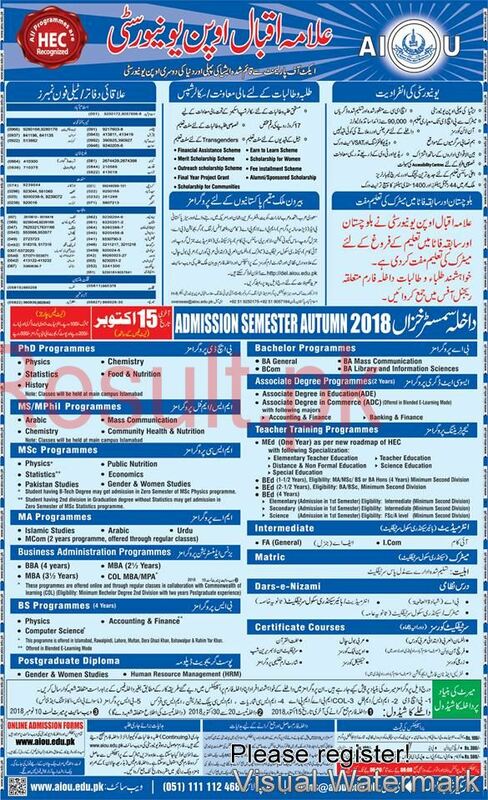 The candidates should keep in touch with this page to get the latest updates regarding AIOU SSC, HSSC, BA/BSc, MA/MSc, BS, MS, B.Ed, M.Ed, B.Com, M.Com, BCS, MCS, BBA, MBA, MPhil and PhD programs. 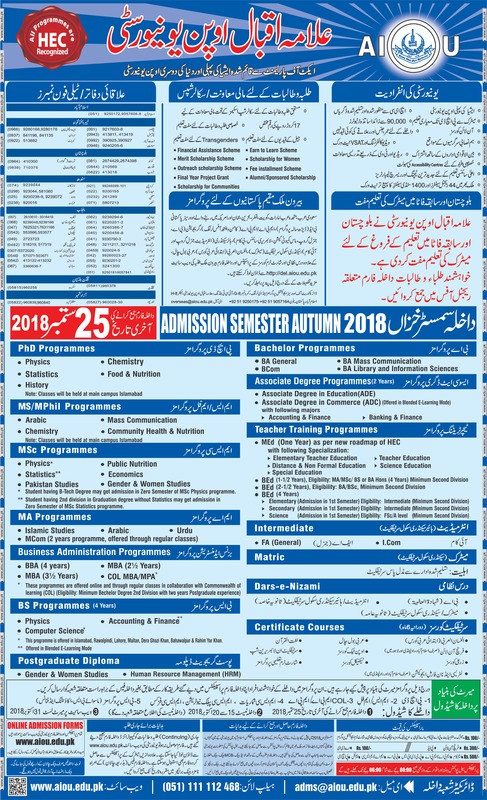 The AIOU also offers admission in the short courses, diploma and certificate courses in different programs to the students living in far off areas of the country. 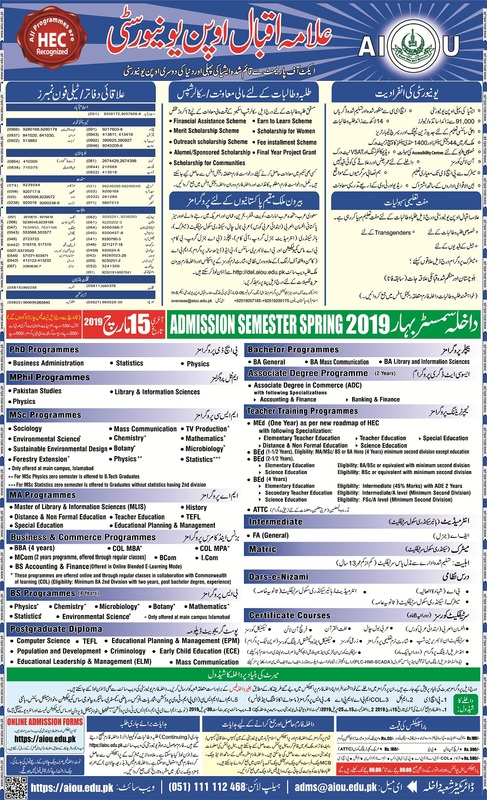 When AIOU announces the admission through its website or newspapers, the candidates can get the complete information and they apply as advised to them. The students, who face the financial problems to get education in the big cities, they can continue their education. The female students, who face the problems in continue their education, they can continue their education while sitting in their homes. The admission forms of all programs are provided online for the information and they can download it to complete and submit to the admission department for their education and also appear in the exams at the end of their course. A. A. I wan a know about LLB in AIOU, for Lahore. Hi sir,madam.i want to do Ms.c economics plz guaid me how can aplly. A. O. A sir ma na bs complete kiya ha. Aur ab ma llb karna chata ho. 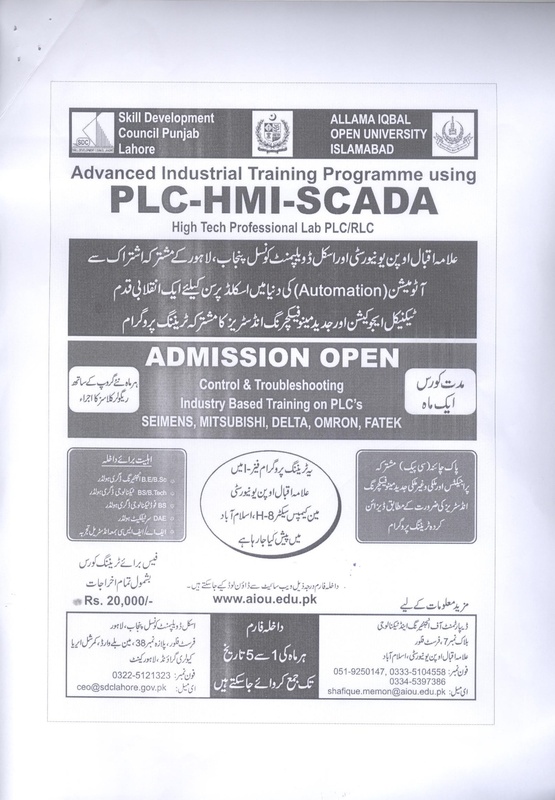 Kb admission ho gy.. Tell me 03013075005. 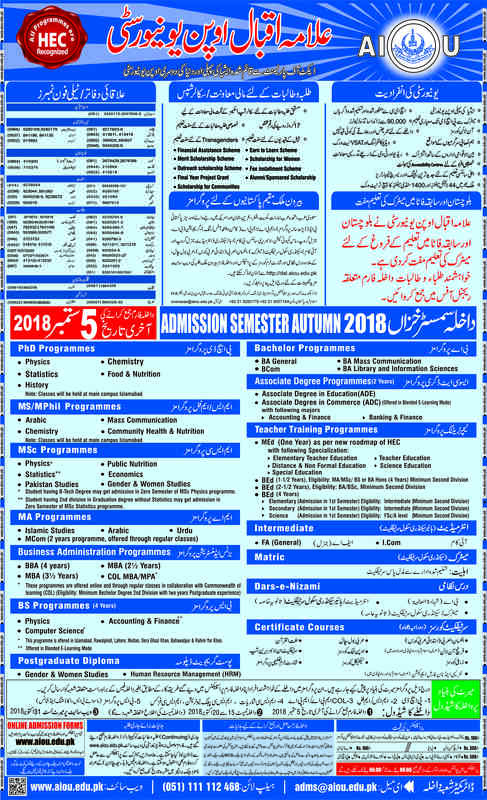 Sir mjh sy 3rd semester ka admission mis ho gaya Hai ab Mai late fees k Sath kesy Jama krwau. Sir Bsc ka admission kasay hota ha. Respected Sir ji, AOA,i want to know that about the LLB programe whan open the addmition plzzzz help me and send me details n my cellphon nbr plzzzzzzzz I request you,Thanks. 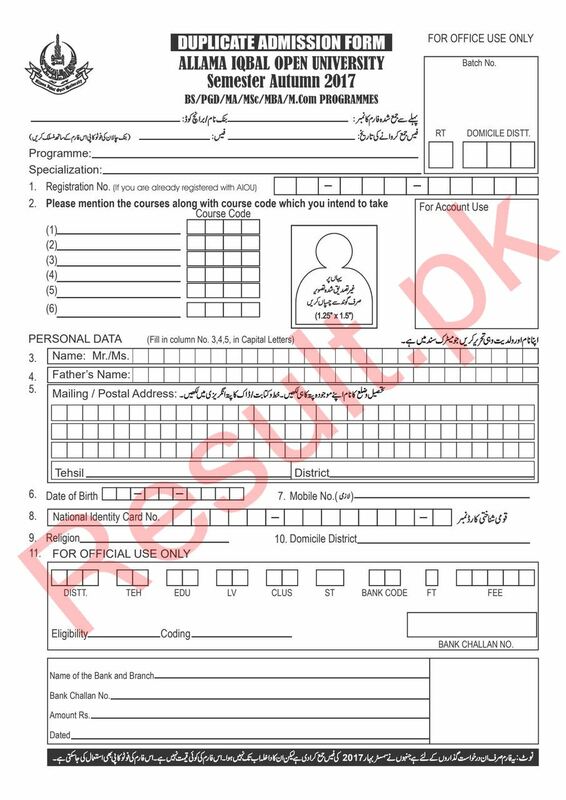 Sir new Admission form kesy download krny prty hain??? salam sir ma na BA part1and part2 ka admission lay hai kp open horahai or is k lay kia kia chia . Dear Sir plz Guide me About Admission M.phill Program After M.com Commerce Accounts and Finance when strat admission . 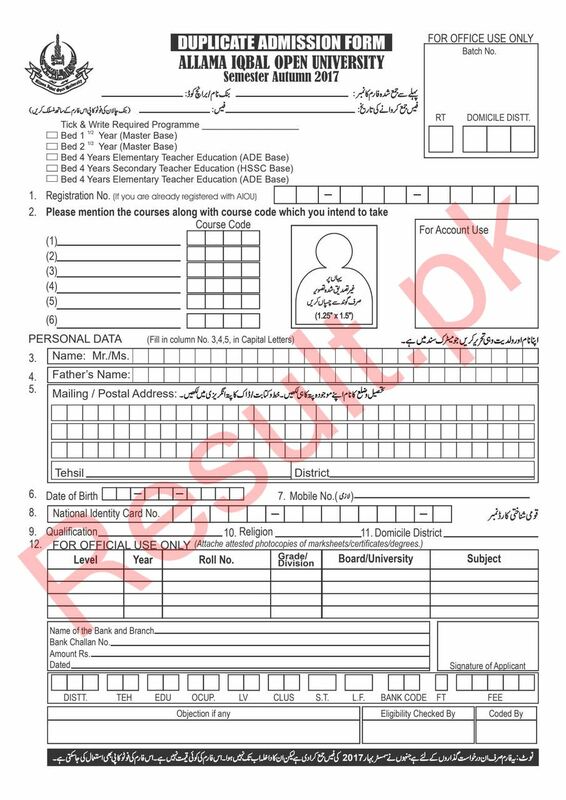 Mijay metric ma re-admission lena ha Is baray ma jankari ki zrorat ha. I want to take admission for M.A .. plz tell me the new schedule of 2019 admission. Sir g mainy 9th aur 10th Main dakhla lana hain Sir g plz mujy dakhly key last date aur fess bta dy shukrya. Sir/mam when will be admission starting for BS mathematics or other bachelors programes. A-O-A Sir! Sir I want to take admission for B.A. 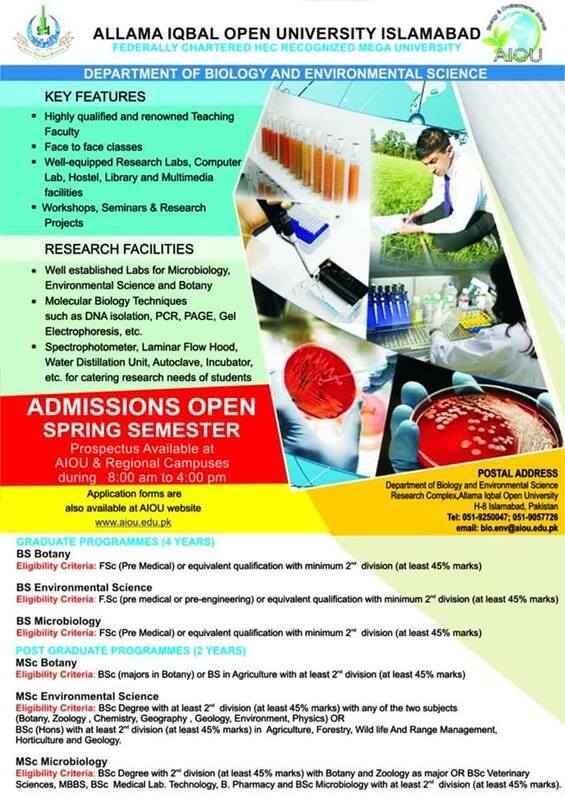 sO plz send me details on my number!about Ld(last date)of admissions. Thank you...! I want to addmission in FA1 2019 kindly.sir tell me date of addmission. I request you sir please. I want to addmission in FA1 2019 kindly tell me date of addmission. Iwanat take admossion in allama iqbal university at the base of DVM. I want take admission in M.Phil. in any about livestock. so please guid me. A O A Sir BA ka admission kab ho rahy hain ??? Plz sir help me. plz sir FA ka admission kb ho ga bta dyn plzz plzzz plzzz. Where Can I find the date sheet and hard copy for admission for FA 1st year? I want to admission in bs psycology.what is the date of admission in bs. Respected sir. Mujhy fsc krni hy ..admission kab ho rhi hy plzz. Respected sir I want admission in LLB. Plz give me detail. i want to take admission in allama iqbal university at the base of Bse and take admission in Msc phy. plz guide how i take admission in uni. I post my Documents for admission in (F.A) dated 25.9.2018. And i dont receieve any response. Kindly tell me when i recieve my books and date sheet etc. 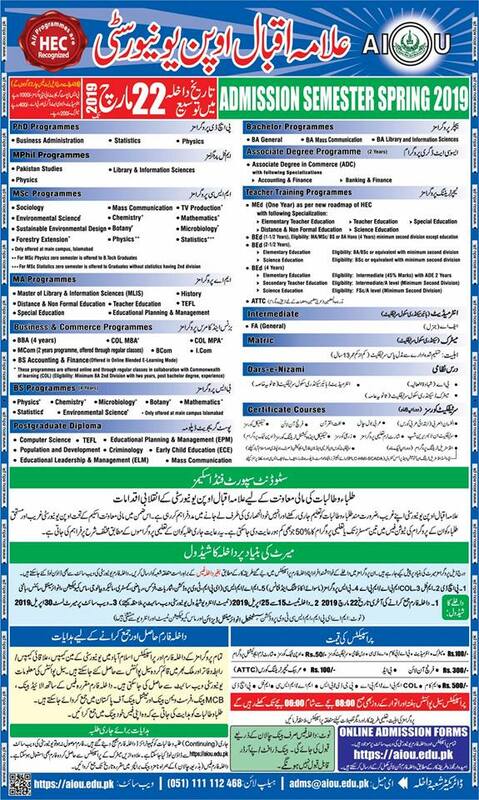 Last date to apply..in Allama open uni??? a.o.a !sir b.a k admition ho rahy hyn yahan pr??? MA ma addimision Lana chahata hon. Sr m ny b.a kiya hua hy ab mujy kon sa sbject rkna chayie aur m.ed ya b.ed krna chahiye aur ap k shedual sbject law ka b section hy pra? 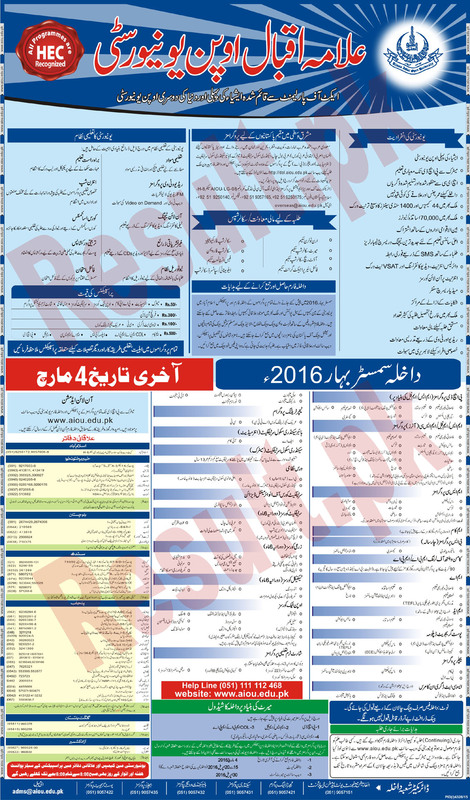 Aslam-o-alaikum sir ab july k bd Intermediate k admission kb open hon gy ? ?